It's been how long? Yikes! A very special birthday! After such a long hiatus from writing it is really hard to start again. Journaling is one of my passions. It certainly pales in comparison to loving and serving my Lord. It also pales in comparison to loving and serving my husband and family but here I am. Writing these days is hard. I struggle with time! I still homeschool several kids. Our oldest completed his first year of college and maintained a 3.8 GPA! 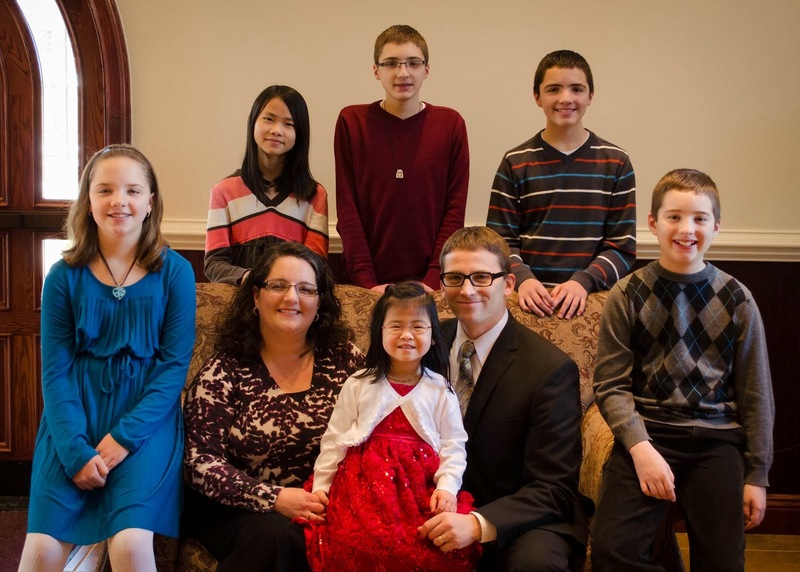 Due to the sheer size of our family we typically do not have large birthday celebrations. Each of the kids have had one birthday party as a child where they invited friends. Then we do something special for their 16th birthday. Jeremy and I always enjoy the planning. Kyle's 16th birthday included tickets to go see comedian, Tim Hawkins. Since his birthday is in January, the trek to some obscure location in the middle of nowhere through a snow storm was almost as fun as the event itself! Selah's 16th birthday happened to fall on Thanksgiving Day. She celebrated her birthday in Pennsylvania with both sides of our family! There were over 50 there to help her celebrate! Micah's 16th birthday included a laser tag/pizza party with the teens at our church. As we remember well, all of our kids ended up with influenza. Ahhhh......the memories! 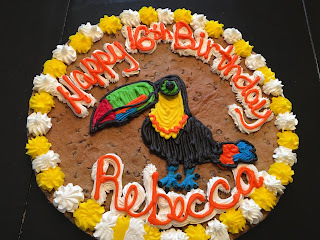 At the end of June we celebrated Rebecca's 16th birthday with a family party here at home. For your birthday we are planning a trip to the National Aviary in Pittsburgh! They have many birds there, including a "keel-billed toucan"! We have to wait until the exhibit opens up again in July! Olivia and Gabby will be enjoying the visit with us. We love you! She has had a great love for toucans for years! Yes, years. I have no idea where or how but it has been there for as long as I remember. It only seemed fitting to make these arrangements! She was utterly shocked! It was so fun to watch! But then we had to wait. Somehow we had to arrange our visit to fit the schedules of 10 people. Several of which have jobs! But we did it! Whose kid is in the front row? She is a bit animated. We drove two vehicles to get there since Kyle had to work late on Friday. I am stunned he (and Ben) drove through the 200 miles and navigated the horrible, confusing, traffic and Pittsburgh streets to arrive safely at my parent's home in Leechburg, PA! We visited Jeremy's mom and dad for a little bit. Olivia and Gabby were introduced to Jeremy's dad...who hilariously, purposefully pronounces words incorrectly. They secretly thought, "That poor old man!" until I saw them struggle to maintain composure. We are so used to it but I realized this was a first for them. We all died laughing! We then went on to my parents' for supper. Olivia and Gabby were enjoying the country life and food! My mom is an excellent cook! They ate all of her yummy pleasures. Saturday morning my dad put Kyle's car in the garage and ran his computer on it to read codes. (Don't be too impressed. I don't actually understand mechanic talk. I've just heard it for my entire life!) He discovered that the mechanic here in WV that "fixed" the exhaust lead did not actually fix the leak at all. My dad was quite upset. Dad said the welding done was not nearly enough to fix the problem and there was a second hole even bigger that was not ever touched. I wish you all could know my dad. My dad is one of the hardest working men I know. He turned 68 this past week and has not slowed down one bit. He is a retired steel worker but works from 8am until 10pm in his garage. He undercharges his customers. He is an excellent mechanic. He is taken advantage of by so many. There is one thing my dad hates.....is a dishonest mechanic. And, especially hates it when they take advantage of his children or grandchildren. And a little bit of quality welding....we are good to go! No more check engine light! We kind of miss it. Kyle got so used to it. After lunch we drove to downtown Pittsburgh's North Side to the National Aviary. Our plan was to buy a ticket for Rebecca to feed the toucan! Unfortunately those limited tickets sold out. I could have cried for her. This is Bob. Pittsburgh's keel-billed toucan. And Olivia.....she looks pretty even when she isn't trying. Two people who bought tickets did not show up. They still did not show. So I did what I dreaded. I sat silent for a few moments then finally asked if just one in our party could take the place of the two who were missing. The National Aviary staff called Rebecca up and she ended up having a mini-private session with the toucan of her choice! She had tears in her eyes! This is an aracari toucan. One of the smallest toucans. She is a star. She has been on Good Morning America, Late Night with Jimmy Fallon, and a few other shows. Huge shout out to the National Aviary staff for unexpectedly making this visit so special. Olivia was also thrilled at this creature. Jeremy.....not so much. He believes they are one of the ugliest things created. We hung around (pun intended) to see "Ferdinand" climb right over our heads! He was a tad faster than we anticipated. It was certainly a fun trip. I'm not used to all the giggling, talking, and laughing in the car! Boys are much different to travel with! We had so much fun! Thank you again, National Aviary, for such a fantastic day!